This section contains a selection of UN documents in the areas of mediation and conflict prevention, including reports of the Secretary-General as well as resolutions and documents from the Security Council and the General Assembly. 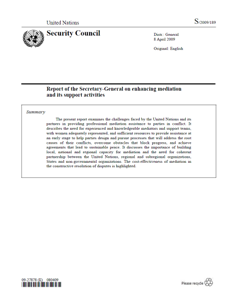 The present report recognizes mediation as an important tool for conflict prevention, management and resolution; analyses five elements of mediation support, providing examples of UN activities within the framework of each element; and sets out the means through which the entities of the UN system can coordinate their support for mediation initiatives at different levels. S/2015/730. Report on "The UN and Conflict Prevention: a Collective Recommitment"
The present report was prepared pursuant to Security Council resolution 2171 (2014). The report considers the evolution of contemporary conflict and the prevention landscape in recent years; provides an overview of ongoing efforts to strengthen UN prevention tools and initiatives, highlighting the cooperation with regional and subregional organizations; and also considers key challenges and opportunities for conflict prevention. A/70/328. Report on "Cooperation between the United Nations and regional and subregional organizations on mediation"
The present report describes efforts to strengthen cooperation and partnership between the United Nations and regional and subregional organizations to build mediation capacity and deepen strategic and operational partnerships in carrying out mediation efforts. It reviews trends in conflict and mediation and recalls the fundamentals of effective mediation as a background for cooperation efforts. The report describes the evolving mediation experience and capacities of the United Nations and regional and subregional organizations and the cooperation which is assisting that capacity development. It identifies different models of cooperation, stresses the importance of coherence, coordination and complementarity in mediation engagements and recommends further work in several areas to strengthen cooperation for effective mediation. The present report examines the challenges faced by the United Nations and its partners in providing professional mediation assistance to parties in conflict. It describes the need for experienced and knowledgeable mediators and support teams, with women adequately represented, and sufficient resources to provide assistance at an early stage to help parties design and pursue processes that will address the root causes of their conflicts, overcome obstacles that block progress, and achieve agreements that lead to sustainable peace. S/2011/552. 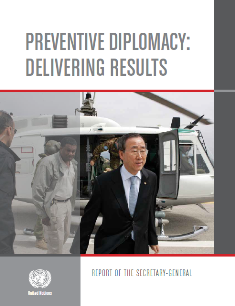 Report on "Preventive Diplomacy: Delivering Results"
The report examines the opportunities and the challenges the United Nations and its partners currently face in conducting preventive diplomacy in a changing political and security landscape. Focusing specifically on diplomatic action taken to prevent or mitigate the spread of armed conflict, the report describes the relevance of preventive diplomacy across the conflict spectrum and as part of broader, nationally owned strategies to promote peace. The present report outlines progress made in implementing the General Assembly resolution 65/283 entitled “Strengthening the role of mediation in the peaceful settlement of disputes, conflict prevention and resolution”, in the context of key trends in the field of mediation. Also submitted as annexes to the present report are the Guidance for Effective Mediation and the views of Member States. The guidelines set out the policy of the Secretariat on contacts between United Nations officials and persons who are the subject of arrest warrants or summonses issued by the International Criminal Court. 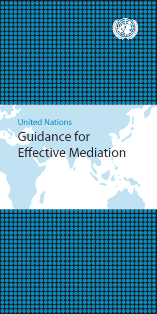 Prepared in response to the request of the General Assembly and in conformity with the Charter of the United Nations, the Guidance aims to inform the design and management of mediation processes. It is intended as a resource for mediators, States and other actors supporting mediation efforts but is also relevant for conflict parties, civil society and other stakeholders. 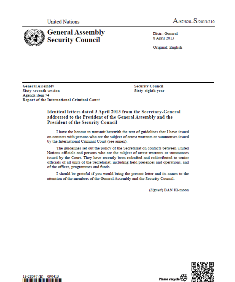 In this resolution the General Assembly reaffirms the respective role and authority of the General Assembly and the Security Council in the maintenance of international peace and security in accordance with the Charter. Adopting by consensus a text on the topic, the Assembly encouraged the United Nations and regional and subregional organizations to continue to develop their mediation capacities; use United Nations Guidance for Effective Mediation in their efforts; and increase awareness of the importance of mediation through conferences, seminars and workshops. In that regard, it welcomed the “Mediation in the Mediterranean Initiative”. The Assembly, encouraging women’s equal and full participation in all forums and at all levels of the dispute settlement and conflict resolution process, encouraged the Secretary-General to continue to appoint women as chief or lead mediators and as members of teams in United Nations-sponsored peace processes. It also asked the Secretary-General to submit a report during the Assembly’s seventieth session on cooperation between the United Nations and regional and subregional organizations on mediation, as well as possible ways to enhance such cooperation, and requested regular briefings to promote closer consultation with Member States as well as regional and subregional organizations and to increase transparency. 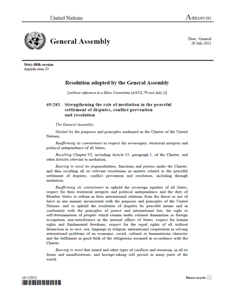 The present General Assembly resolution takes note of the Secretary-General’s report “Strengthening the role of mediation in the peaceful settlement of disputes, conflict prevention and resolution” and encourages the use of the United Nations Guidance for Effective Mediation by all relevant actors. Furthermore, the General Assembly decides to continue its consideration of mediation on a biannual basis. The present resolution recognizes the increased use of mediation, reflects on current challenges facing the international community in such mediation efforts, and calls on key actors to develop their mediation capacities. The 2005 World Summit Outcome, endorsed by General Assembly resolution 60/1, outlines a plan of action in four key areas: development, peace and collective security, human rights and strengthening of the United Nations. In particular, it calls for measures to promote a coherent and integrated approach to the prevention of armed conflict and to strengthen the capacity of the UN for the prevention of armed conflict. 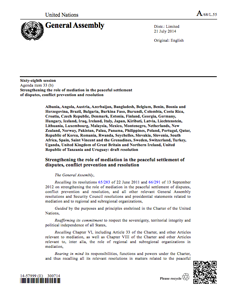 The annex to the General Assembly resolution 37/10, also known as the Manila Declaration on the Peaceful Settlement of International Disputes, reaffirms the principles set out in the Charter that all States shall settle their disputes by peaceful means and listed, inter-alia, negotiation, mediation and good offices as means to seek a peaceful settlement. This Security Council resolution seeks to fill-in gaps in the existing Sexual Violence in Conflict (SVC) framework, through establishing a conceptual framework and practical guidance on how to operationalise SVC on a consistent basis throughout the peace and security agenda, including, in all aspects of UN conflict resolution efforts. S/RES/1960. Security Council Resolution on women and peace and security. Conflict-related sexual violence. This Security Council resolution provides the accountability architecture needed to list and de-list perpetrators, as well as to monitor patterns and trends of conflict-related sexual violence. Security Council resolution 1960 (2010) also calls for an expanded mandate to comprehensively address sexual violence, when used as a tactic of conflict or emerging as a consequence of conflict. S/RES/1820. Security Council Resolution on women and peace and security. Conflict-related sexual violence. This Security Council resolution recognized for the first time conflict-related sexual violence as a tactic of warfare and as a serious threat to international peace and security. The resolution calls for an end to widespread conflict-related sexual violence, the accountability of all actors to counter impunity for such crimes and calls on the United Nations to develop appropriate mechanisms to provide protection from violence and respond to sexual violence and other forms of violence against civilians. S/RES/1888. Security Council Resolution on women and peace and security. Conflict-related sexual violence. This Security Council resolution addresses the obstacles to women’s participation in peace processes and peacebuilding. 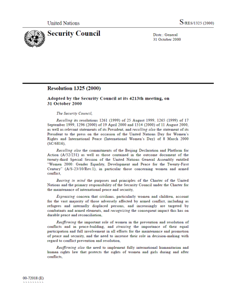 The resolution 1889 (2009) calls for the establishment of a global set of indicators to track the implementation of Security Council Resolution 1325 (2000), emphasizes the need to ensure gender mainstreaming in all post-conflict peacebuilding and recovery processes and requests the Secretary-General to report on women’s participation and inclusion in peacebuilding and planning in the aftermath of conflict. This was the first landmark Security Council resolution on women, peace and security. The resolution 1325 (2000) addresses the impact of war on women and the importance of women’s full and equal participation in conflict resolution, peacebuilding, peacekeeping, humanitarian response and in post-conflict reconstruction. The resolution also calls for special measures to protect women and girls from conflict-related sexual violence and outlines gender-related responsibilities of the United Nations in different political and programmatic areas.